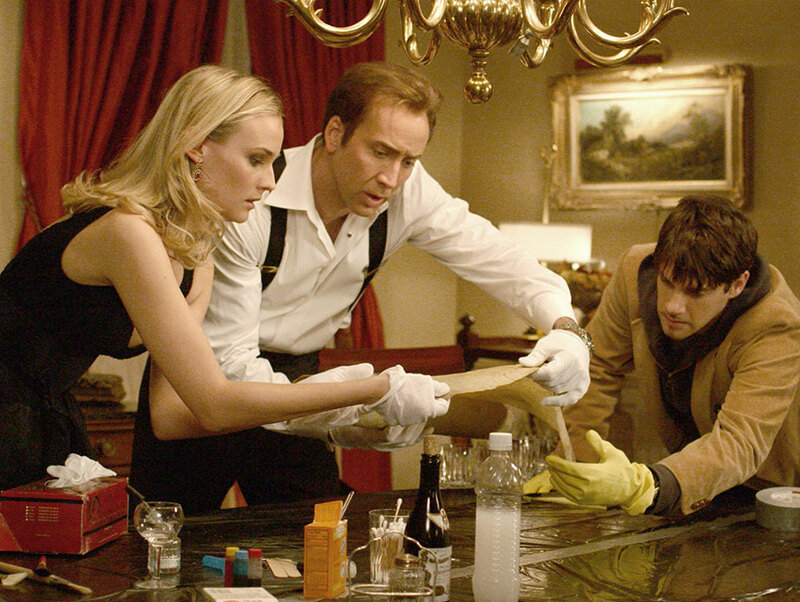 Yesterday marked the 10th anniversary of the release of Walt Disney’s National Treasure. I adored the 2004 heist flick. Despite the fact that I own the DVD, I can’t seem to tear myself away whenever I come across an airing of it on TV. So I was delighted to learn that, though set in Washington, D.C. and Philadelphia (amongst other out-of-state locales), quite a bit of filming did take place right here in L.A. The breathtakingly beautiful First Congregational Church of Los Angeles, located at 540 S. Commonwealth Ave. in Westlake, masquerades as the interior of New York’s Trinity Church, the site of the flick’s climactic final scene. And the home of Patrick Gates (Jon Voight), where Benjamin Franklin Gates (Nicolas Cage), Riley Poole (Justin Bartha), and Abigail Chase (Diane Kruger) use lemon juice and heat to uncover a secret code on the back of the Declaration of Independence, can be found at 1030 Buena Vista Ave. in South Pasadena. My favorite of National Treasure’s SoCal locales, though, is easily the picturesque Starkman Building at 544 Mateo St. in downtown L.A.’s Arts District, which serves as Ben’s apartment in the movie. The red brick structure was only shown briefly towards the beginning of the film, in the scene in which the FBI shows up to Ben’s pad to investigate the theft of the Declaration of Independence. The Starkman Building, which is also known as the Pan Pacific Warehouse, was built in 1908 and originally served as a factory for the Nate Starkman & Son company. Today, the 27,702-square-foot structure consists of five loft spaces, ranging from 1,500 to 5,000 square feet, and an attached one-story warehouse. 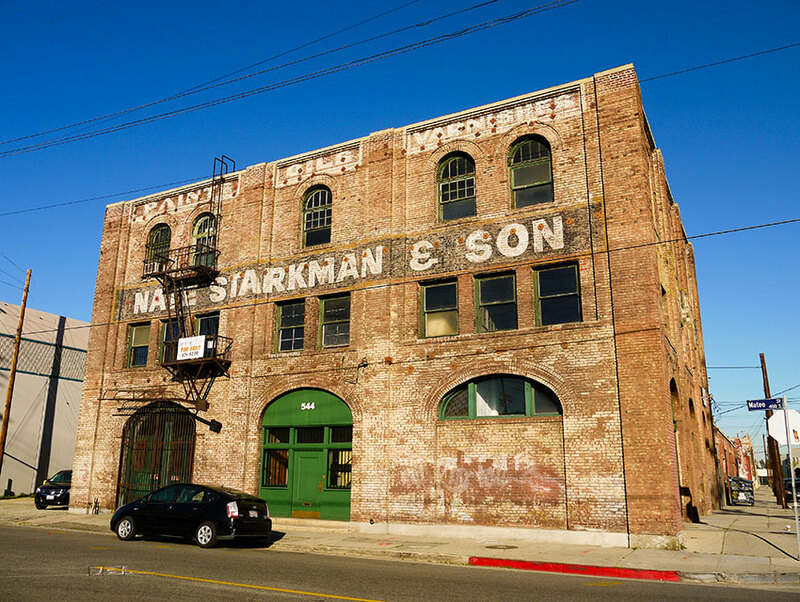 The building’s arresting exterior, with its green-arched windows and doorways, fading “Nate Starkman & Son” signage and iron fire escape, is screaming to be photographed. The first time I visited the place, I shot off easily about 100 images. Location managers have done the same over the years. In fact, the Starkman building has been immortalized in such a vast number of productions, it would be virtually impossible to chronicle them all. But I’ll make an attempt. The Starkman Building pops up regularly on It’s Always Sunny in Philadelphia as the exterior of Paddy’s Pub (the interior is a studio set). The structure is the site of the riotous street party in the original The Fast and the Furious film. And it is where Ron Swanson (Nick Offerman) is pulled over by a policeman in the Season 4 episode of Parks and Recreation titled “The Comeback Kid.” The structure has also appeared in episodes of Parenthood, Charmed, Revenge, House, Castle, CSI: NY, Ghost Whisperer, 24 and Criminal Minds, as well as in the movies Date Night, Repo Man, and Lovelace. By the end of National Treasure, Ben has moved on to far more fanciful digs. Though that humongous mansion (which can be found in Newbury, England) is undeniably glorious, I much prefer the striking patina and urban antiquity of the Starkman Building.